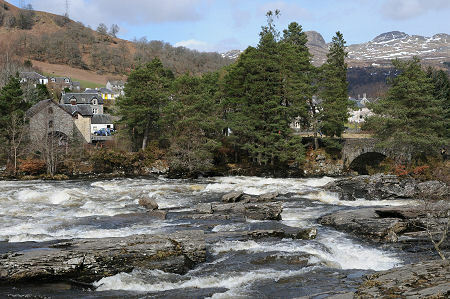 The River Dochart travels in a roughly easterly direction from Loch Dochart near Crianlarich along Glen Dochart to Killin before flowing into Loch Tay. The waters of the loch emerge at the far end as the River Tay so it is arguable that the River Dochart forms a western extension of Scotland's longest river. 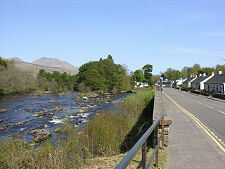 As it approaches Killin, the bed of the River Dochart broadens out at the same time as its gradient steepens. This results in the spectacular Falls of Dochart, one of Scotland's more impressive, and certainly one of its most easily accessible, waterfalls. Perhaps the most striking thing about the falls are their extreme variability. 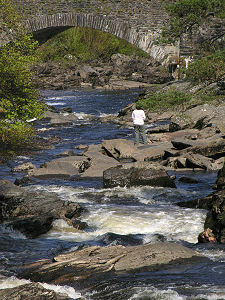 The waters that flow through the river drain an area to the west that includes the eastern side of Ben Lui and the northern side of Ben More, and the falls themselves can vary from a flow so low it can be hard to spot amongst the many rocks of the river bed, to a raging torrent that completely covers most of those rocks. 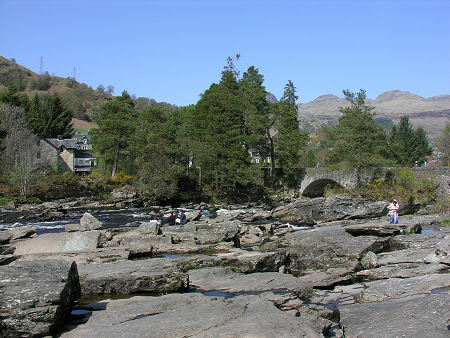 At the Killin or lower end of the falls, the flow narrows and is directed through four channels of unequal width crossed by the Bridge of Dochart. This was first built in 1760, though part was later washed away in a flood and had to be rebuilt in 1831. It is difficult to believe that the river could ever have been fordable here and it seems likely that until the bridge was built the main road west from Killin followed the line of the very minor road that still runs for five miles along the north side of the valley before crossing the river near Ledcharrie. Today the falls are bracketed by two interesting buildings. On the north side stands what used to be the Breadalbane Folklore Centre, housed in what was originally called St Fillan's Mill when it was built to harness the waters of the river in 1840. The Folklore Centre closed in 2011 and the Old Mill, as it is now known, has more recently become home to an arts and crafts shop. 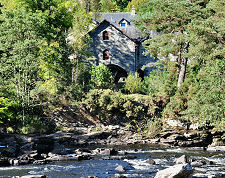 On the south side of the river is the Falls of Dochart Inn, which started life as a blacksmiths in the late 1800s before later being converted for use as a hotel. An island in the middle of the river on the downstream side of the bridge is known as Innis Bhuidhe. This is home to the Clan MacNab Burial Ground. 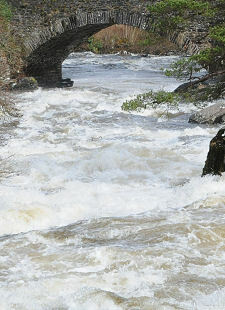 Its use dates back to the 1700s (presumably the late 1700s, after the island was made accessible by the Bridge of Dochart). An oblong enclosure within the burial ground is home to fifteen graves, nine of which are the final resting places of clan chiefs, plus a medieval grave slab which suggests that at least one earlier burial did take place here.